A wok, a round-bottom and now also available flat-bottom, bowl-shaped pan used for centuries in Chinese kitchens. This unique-shaped pan was designed out of necessity to conserve on fuel because a wok conducts heat very efficiently; uses up little kitchen space since a wok takes the place of many pots and pans. 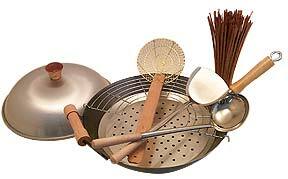 With your wok you can stir-fry, steam, braise, sauté, simmer, deep fat-fry, stew and even smoke. The advantage of using a wok rather than a skillet or dutch oven is that the flared sides and depth permit rapid tossing of many ingredients and the use of a minimum of oil. The bottom of the wok gets extremely hot and the sides remain cool, thus, the food is cooked in the bottom and tossed to the sides; with this constant motion, vegetables are cooked just right…in the hot bottom, then tossed to the cool sides--quickly, efficiently, nutritiously! Do you need wok ring ($2.95) to stabilize your round bottom wok on the stove? Watch our video on how easy it is to season a wok. What are the "Wrongs in Woking"? Watch a short video on how to wok right featuring Grace Young, best-selling author of "The Breath of a Wok."